Golden Sunshine Entertainment Products Limited is professional manufacturer of luminous ink contact lenses for reading all kinds of luminous marked cards. According to the requirements of different people from different places all over the world, a group of chemist and technical staffs are dedicated in developing various types of special luminous ink contact lenses. Now a new kind of poker cheating contact lenses which is specialized for blue eyes brought out by Golden Sunshine. By adopting sandwich technology, these luminous ink contact lenses do not have any side effects on users' eyes. With the Sophisticated laser dyeing technology, Golden Sunshine has already solved the problem of eyes automatically focus when the customers wear the small dyed circle contact lenses under different light. The newest luminous marked cards contact lenses for blue eyes will not change your eyes' color and can see the marks very clearly. When you wear these blue eyes luminous ink contact lens, you feel comfortable. These playing cards contact lenses are comparably expensive. If you want to buy your magic kits, luminous ink contact lenses and luminous enhancing sunglasses, also our juice marked cards, here is the best choice! Relatively, we also have another kind of luminous contact lenses. These contact lenses are also suitable for blue eyes and will not change eyes’ color. With the standard technology, this kind of contact lenses also has some defects. These contact lenses will have the defects of pupil’s automatically change under different lights. Customers can see the marks with luminous contact lenses but some customers do not feel so comfortable. The cheapest contact lenses will change your eyes color. If you do not care to change your eyes’ color, you can use this kind of cheapest luminous ink contact lenses. With these special cards contact lenses, you also can see the marks clearly. Since some customers never wear luminous ink contact lenses before, they may feel not so comfortable. At the very first time for you to wear contact lenses, you should extend your wearing time gradually. It is not a good way to wear it for the whole day at the first time. It is because that the corneas could not get used to the environment of the mechanical stimulation of the lenses and the Hypoxic metabolic. The more you purchase the more discounts you can get. 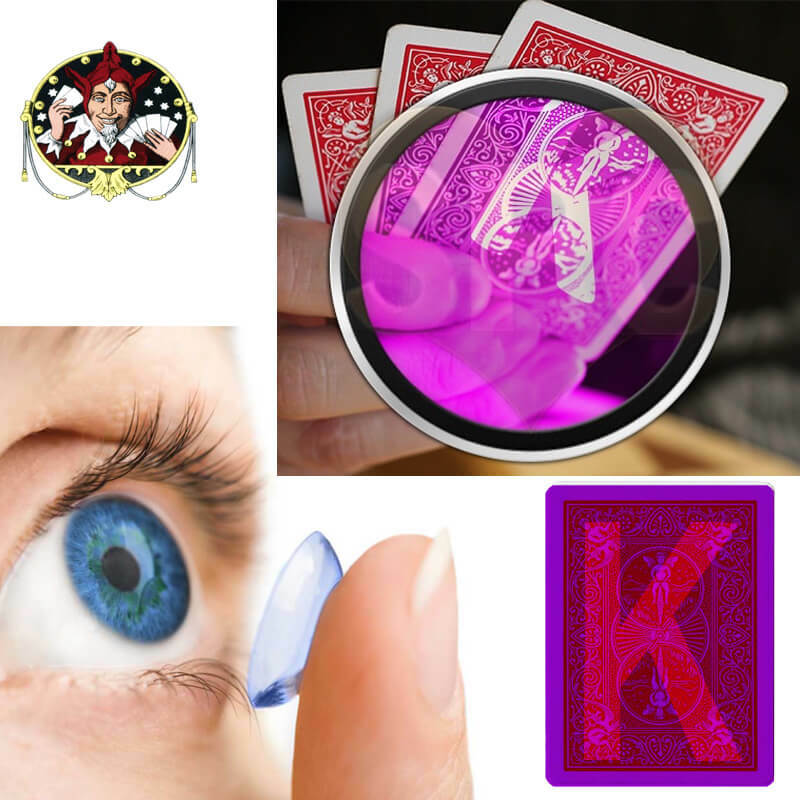 Why some customers can not see marked deck cards clearly with the luminous ink contact lenses? Some producers are not responsible for the quality of luminous contact lenses, nd they just sell the bad quality contact lenses. Of course, the price for these poor quality contact lenses is very low. If you wear the bad quality luminous contact lenses, after a period of time, the dyed area will diffuse and the original color will lose gradually. However, it will always hurt your eyes and sometimes the lenses will move around in your eyes. If you are finding the best quality luminous ink contact lenses to see marked poker cards, please feel free to contact Miya in cards999.